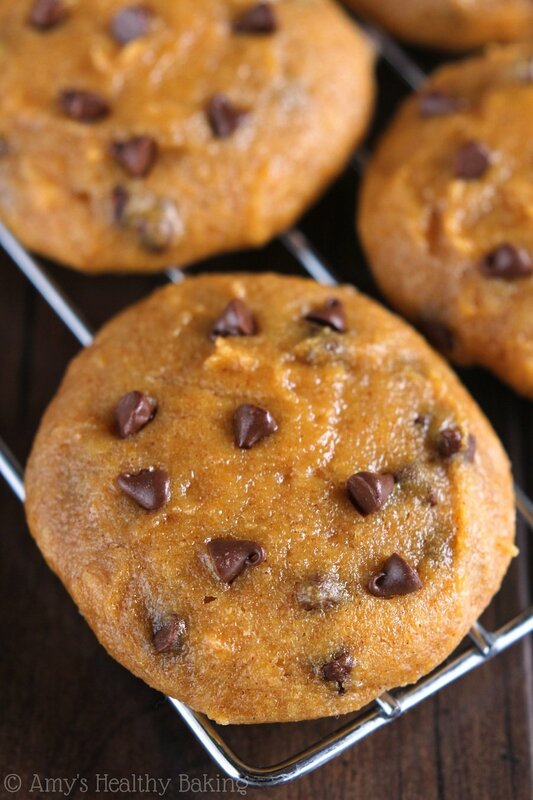 An easy recipe for the BEST pumpkin chocolate chip cookies. Cozy, decadent & pure comfort food—just without the guilt! As a sophomore in college, my three roommates and I decided to bake sweet treats for all of our friends’ birthdays in our apartment complex. However, we never actually delivered them on time. We were usually just a few days late, but one guy received his almost two months after his special day! We said it was because we lived in the “Delayed Reaction” apartment, where the TV took a minute to turn on, the internet needed a few extra seconds to start up, and the microwave always started a good twenty seconds after you pressed start. So we were just following suit! Everyone laughed when we arrived carrying plates of cookies on their doorsteps, and they never minded our “Delayed Reaction.” It meant that they could celebrate their birthday for at least a week! We always tried to slyly ask people’s roommates what their favorite cookies were since those wouldn’t compete with the typical birthday cakes. With the first person’s birthday coming up, his roommate revealed that his favorite cookies were pumpkin chocolate chip, and I thought that was the strangest combination ever. Pumpkin? A vegetable? With… Chocolate?? But I baked them anyway, and we split two extra cookies between the four of us girls to sample. Oh my goodness! 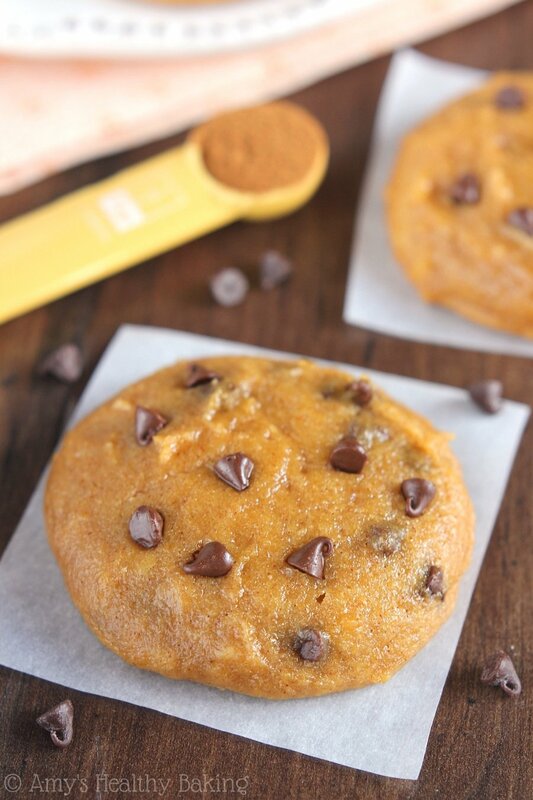 The sweet pumpkin… The warm cinnamon… The rich chocolate… I nearly swore on the spot to always include pumpkin in the chocolate chip cookies from then on! 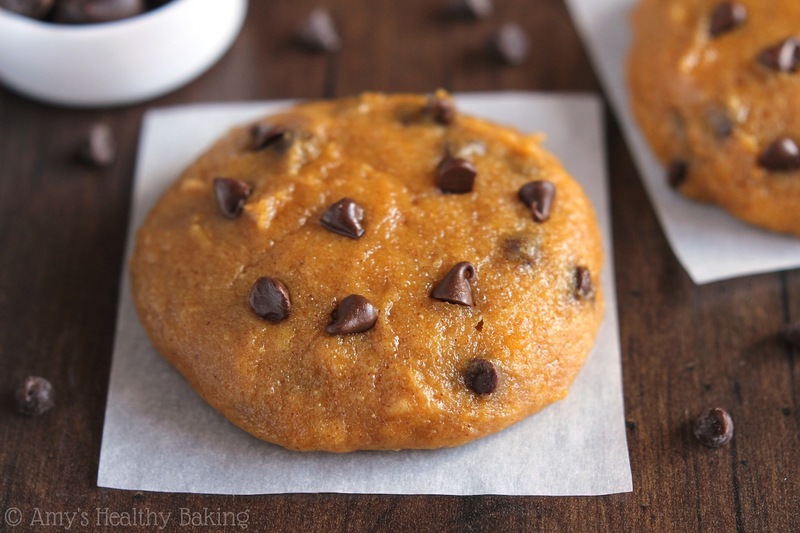 Yet the problem with pumpkin cookies is that they often turn out cakey, not quite as soft and chewy as regular chocolate chip cookies. 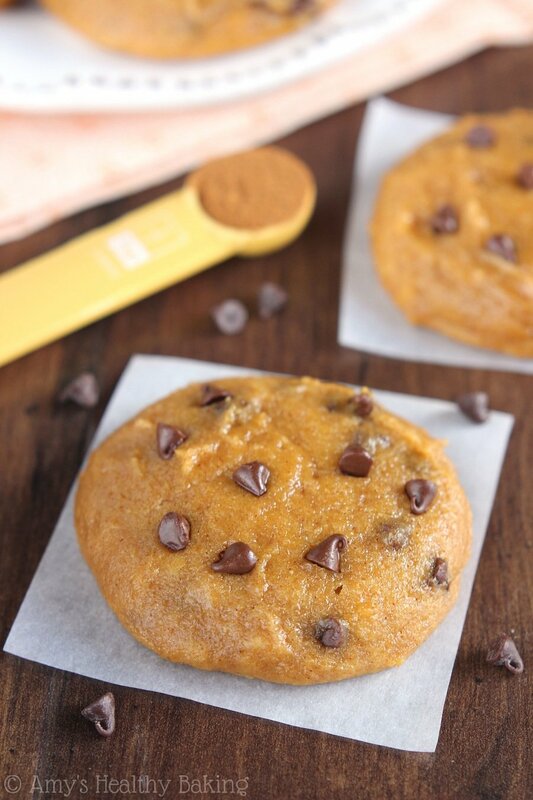 So this past month, I set out to create the Ultimate Healthy Soft & Chewy Pumpkin Chocolate Chip Cookies. After six different batches, I finally did it! The dry ingredients are fairly straight forward (well, minus the cornstarch twist. It helps keep the cookies chewy—read about it here or just trust me on that!). On the other hand, the wet ingredients required some testing and tweaking, especially the pumpkin purée. 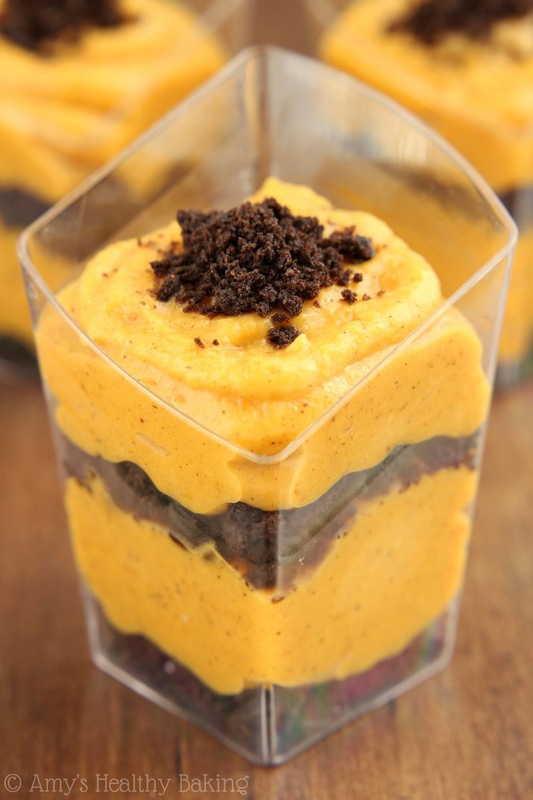 Pumpkin purée contains a lot of moisture, which dries out baked goods and leaves them cakey. However, it can also act as a binding agent to hold the cookie dough together. Eggs do the same thing: add lots of moisture and bind cookies together. To balance that out, I omitted the egg and used all pumpkin purée instead. 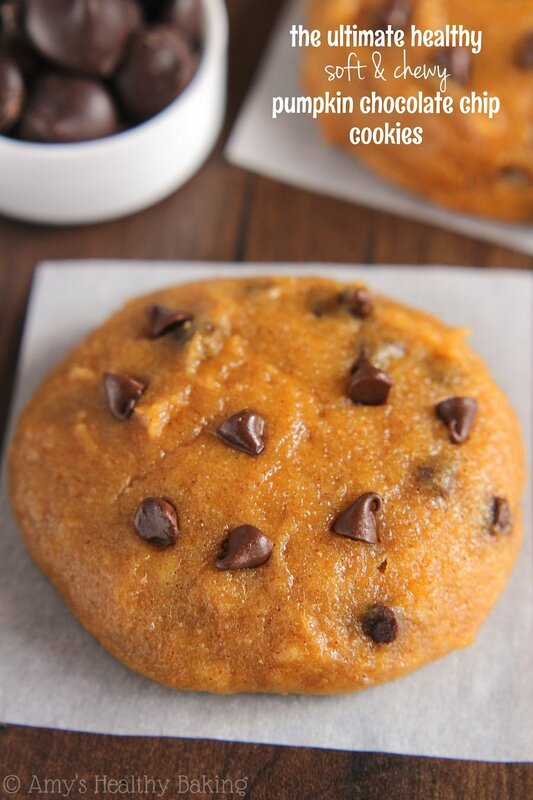 This kept the cookies soft and maximized the pumpkin flavor. To make the cookies chewy, I used melted butter. Unlike regular softened butter, melted really helps increase the chewy factor. This means you can put away your mixer—no butter and sugar to cream! Because maple syrup is a liquid, it makes the cookie dough really moist and tacky, so you must chill the dough before baking. Chilling is mandatory. Only 30 minutes—just enough time to wash the dishes and wipe up any spilled flour. Now that your cookie dough is chilling, you’re probably wondering… Why did I use miniature chocolate chips? I prefer lots of littler bursts of chocolate over just one or two bites containing big chocolate chips. Their smaller size also helps ensure that the cookie dough binds together better and doesn’t break apart in your hands while eating. That’s always a plus, especially if you’re dunking them in milk! Because the cookie dough will still be somewhat tacky after chilling, do not try to shape it with your hands. Use a cookie scoop or a spatula to shape it into rounded mounds. If you prefer extra thick cookies, make sure they’re as tall as they are wide. If you prefer wider and thinner cookies, flatten them just a bit before popping them in the oven. To ensure the cookies stay soft and chewy, we’ll underbake them just a tiny bit; then leave them on the warm baking sheet for at least 10 minutes to allow the centers to set and finish baking. This gives them the most irresistible texture—if you can wait long enough for them to cool! So there you have it! 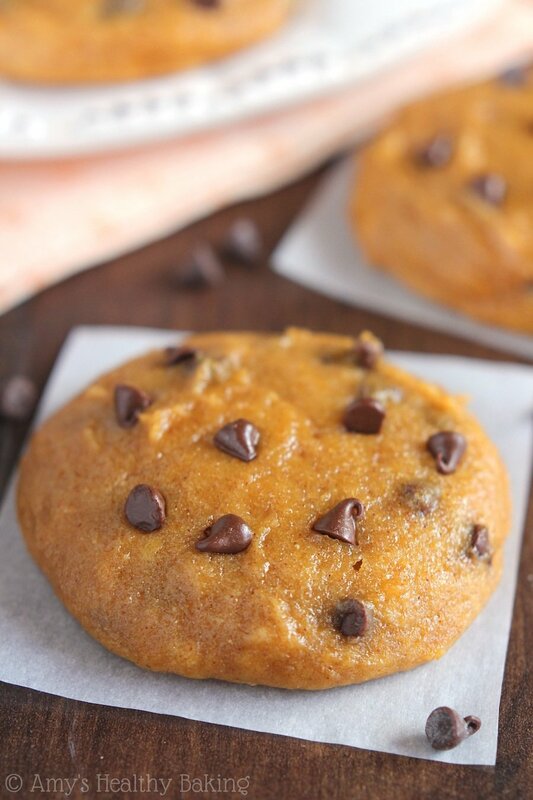 The Ultimate Healthy Soft & Chewy Pumpkin Chocolate Chip Cookies, in all of their cozy fall glory. 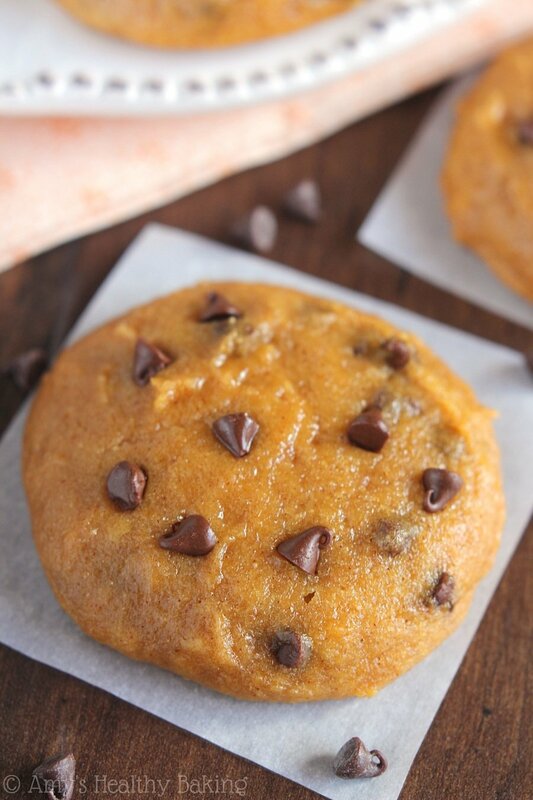 Packed full of pumpkin and lots of decadent chocolate, they taste like pure comfort food—not healthy at all! I sent a batch with my guy when he visited his friend, and he said that in the 30 seconds it took him to run out to his car and walk back inside his friend’s house, four of the cookies had already disappeared from the bag. Four whole cookies! Notes: This cookie dough spreads a little, but not very much. If you prefer wider and thinner cookies, flatten the dough a little more before baking. (Flatten to no less than half of the rounded scoops’ original heights.) See the video above! For the gluten-free flour, use the following: ¼ cup (30g) millet flour, ¼ cup (30g) tapioca flour, 3 tablespoons (21g) coconut flour, and ¾ teaspoon xanthan gum. Most store-bought gluten-free flour blends will work as well, if measured like this. Whole wheat pastry flour, regular whole wheat flour or all-purpose flour may be substituted in place of the white whole wheat flour. 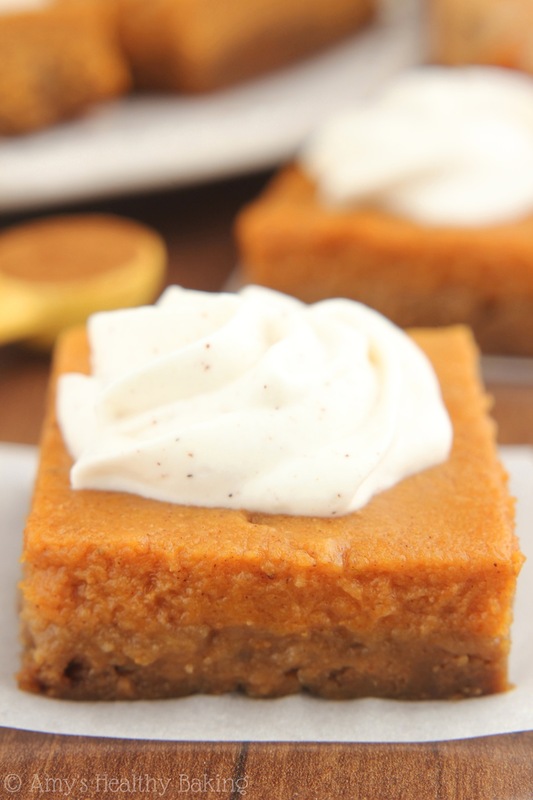 For the best pumpkin flavor, use agave instead of pure maple syrup. Honey may be substituted for either the agave or pure maple syrup. Coconut sugar or granulated sugar may be substituted as well. 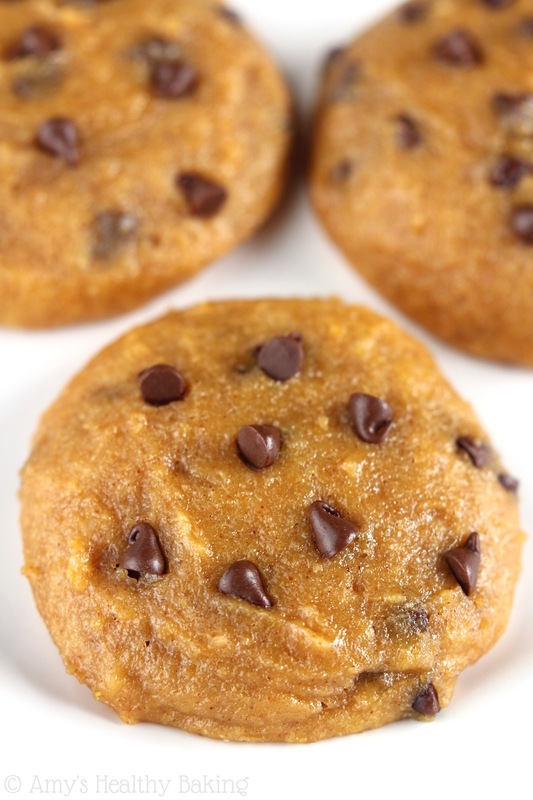 However, when made with either coconut or granulated sugar, the cookie dough does not spread at all while baking, so you will need to flatten the rounded scoops of cookie dough on the baking sheets before placing in the oven. They’re generally done baking in about 13-15 minutes instead. Anything I could sub for corn starch? Perhaps arrowroot starch/powder? Can’t wait to hear your thoughts! Thanks for explaining the science/details behind your recipe. 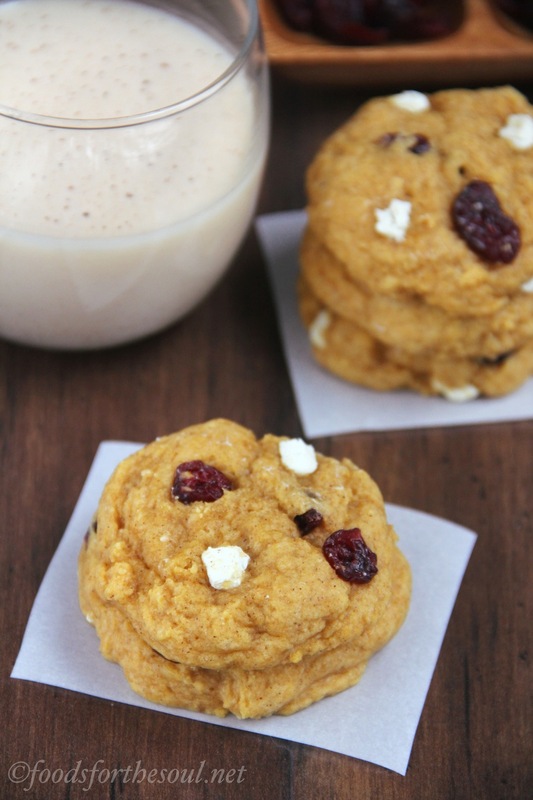 How do we make the pumpkin puree for the cookies ? I really appreciate your interest in my recipe Harshi! I actually buy canned pumpkin purée to make all of my pumpkin recipes. It’s much easier and less time-consuming for me than making my own pumpkin purée! 😉 If you click on the pink “pumpkin purée” text in the ingredients list, that’s a link that shows what the canned pumpkin that I use looks like! (The link wasn’t working earlier, if you tried previously, but it is now!) 🙂 I can’t wait to hear what you think of these cookies!